VW Events Calendar 2019 | List of VW shows UK & Abroad - Updated constantly so keep checking back! Upcoming Events - *Always confirm. 2019 will be the seventh Field of Dreams Aircooled VW Festival! FoD7 will be 30th August - 1st September 2019. We hope to see lots of you back once again! *Advance weekend tickets only £30.00! Set in the grounds of Alnwick Castle, Mighty Dub Fest has become a major event in the north east VW calendar. 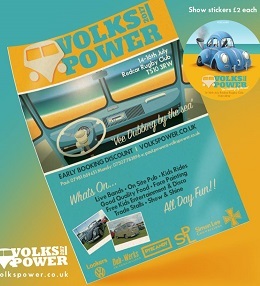 Classic Volks will be there, we hope you will too. VW family weekend festival with trade, car show, live music and so much more. Come and join in this special weekend with the incredible back drop of Alnwick castle. Do you run your own Volkswagen Show or organise a VW event? If you have a VW show that you wish to have listed on our calendar, simply contact us today with the details (Date, Location, Name of the show, Contact details and/or Website link). We will list it on our Volkswagen Event calendar - FREE OF CHARGE! FREE Event Listing! Email us your VW Event! We want to hear from you! 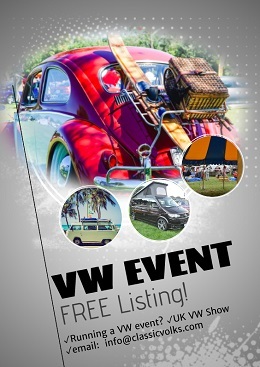 We do not charge to have your VW event listed on our vw event calendar - send us an email today to get started. Field of Dreams Aircooled VW Show 2019 tickets are already selling fast - be sure to get your weekend camping tickets while you still can. Visit our show page to buy in advance to take advantage of the cost savings. Tickets cost more when bought on the gate. Don't forget to always confirm with the destination show organiser before setting off to ensure that the venue, prices and dates are un-changed. Events listed on our page are subject to change. See at a VW show sometime soon!